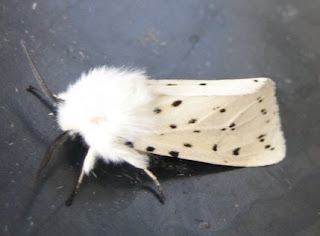 The Ermine moths make a nice change from all the brown ones, specially the White Ermine. It looks just like a member of the House of Lords out for the evening. The dots and dashes vary a lot, so you seldom get two alike. They avoid that phenomenon of two women wearing identical dresses at the same party. Why aren't they all eaten by birds, given that we seldom have snow when White Ermines are about? They're poisonous. The one at the bottom is a Buff Ermine. A bit last-year, I think. Rain last night, so no trapping. Instead here's a language lesson and another competition. Chatting with Cheryl about 'psyche' the dual classical Greek word for 'spirit/soul' and 'butterfly' (see Comment on immediately previous post) got me thinking about Indonesian. The Indonesia for butterfly is kupu-kupu. 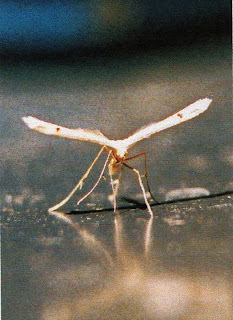 The Indonesian for moth is kupu-kupu malam. But kupu-kupu malam literally means 'butterfly of the night' and is also slang for prostitute. 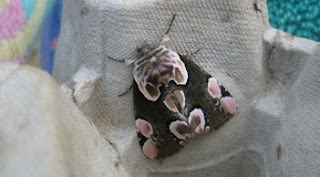 I know this because I once collected moths in Sulawesi (formerly Celebes). Oh, how knowledge-packed blogging can be. 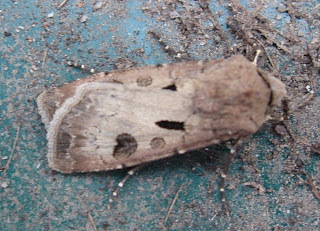 Now the competition: look at the wing patterns of this moth (currently a nightly visitor in Leeds) and guess its name. I'll help with the clue that it's called the Blank-and-Blank and the two Blanks rhyme. Sorry. I've been remiss. 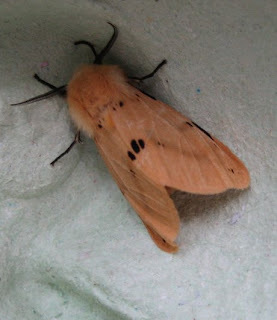 I've been on about my moth trap for nearly two weeks, without explaining what it is. This (see pic) is what it is. It's called a Robinson trap, which I like (rather than a mercury vapour closed circuit whatever trap in off-putting jargon). I will try to find out who Robinson was and tell you. It consists of the said mercury vapour light on top of a plastic funnel into a sort of huge casserole dish. Fill the latter with eggboxes and the moths come to the light, creep in and kip out. I was very pleased to find that it came from Watkins & Doncaster (http://www.watdon.com/) who provided me with my first net and - I regret to say - killing bottle in 1957. I don't actually know what a mercury vapour light is or why you need one for moths, but I will research that and reveal all when I have time. Final thought: moth traps are VERY VERY bright so you need nice neighbours. This Peppered moth is a frequen visitor to the trap at the moment. It's a moth of great significance. When I was a boy, the melanistic (dark) form was much more common in industrial areas such as Leeds. It was better able to camouflage itself on sooty surfaces. (see second pic). 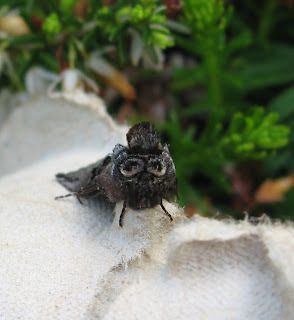 The eminent doctor and butterfly/moth expert Sir Cyril Clarke did an excellent correlation between the decline of these dark Peppereds and the increase of 100-year-olds (people) in the UK - both indicating a fall in pollution. Clarke is justly honoured for his solution of the rhesus negative 'blue babies' blood problem in infants. He cracked this through genetics, studying similar mismatches in Swallowtail butterflies which he bred at home. 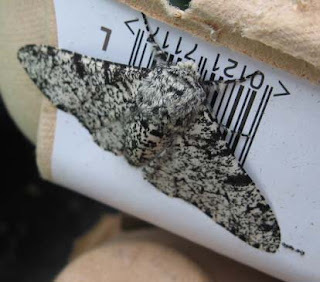 If he was still alive, I would show him my Peppered moth and ask if he thought it had somehow correlated with the black and white of the barcode on the eggbox. Back home; and here's an example of the grey/brown phenomenon I chat about below. I think this is a Dusky Brocade but there are a number of contenders for moths like this, including one which is appropriately called the Confused Moth. You have to have patience. But the patterns on the wings are delicate and lovely, and as I think you can see from my pic, form excellent camouflage. You need this if you are a moth. I'm in London today and woke up early cos of the city's mighty roar. My son Tom lives here and mocked my trapping the other day by sending me a phone photo of an Angle Shades which had come into his flat. 'Who needs a moth trap? In London they just come come calling," he said. 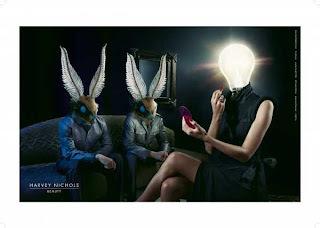 The photo was even more blurred than mine usually are, so instead here's an award-winning advert by the London agency DDB for that famed Leeds store Harvey Nichols. Is this how moths feel? Possibly. 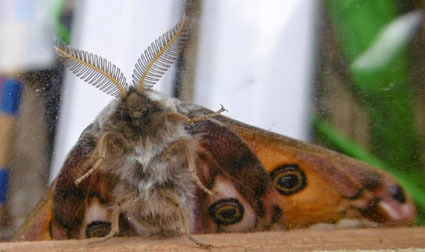 Some collectors have used captive female moths and butterflies to attract males with their amazingly long-distance pheromones. Did you know that Vladimir Nabokov was an expert butterfly and moth collector? Have you heard of the word Wayzegoose? It isn't a type of moth. 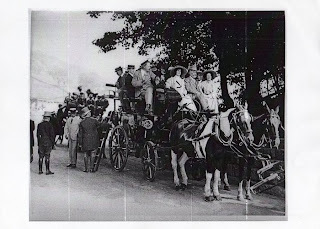 It's a printers' - and hence journalists' - works outing of the type which we of the Guardian in the North (the paper's true heart) still organise. This is our legendary editor C.P.Scott leading a wayzegoose, surrounded by the prettiest members of his staff. But where is the moth? I have a had a busy time today cos I had to report on the coal train hijack at Drax power station. But before I left (at 5.30 aaagh), I checked the trap and found this sinister looking beast. Actually from on top he (or she) is another very brown, very indistinguishable specimen. 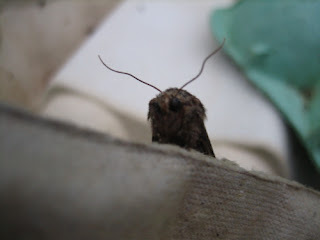 But every moth has his (or her) intriguing side, as this shows. Here we are. 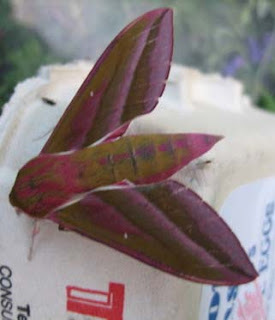 The Elephant Hawk Moth. isn't it lovely, even in my inexpert photographic hands. When I was 13, I made friends with the curator of natural history at Leeds Museum, John Armitage. He was a lovely man, very knowledgeable and also a highly skilled miniaturist painter who used to forge postage stamps. He told me and my brother Andy that if we went in August and looked on the rosebay willowherb along Leeds ring road at Adel, we would find Elephant Hawk Moth caterpillars (they are grey with 'eyes' and 'trunks' which led to the moth's name). And so it proved. But this one is from my light trap. 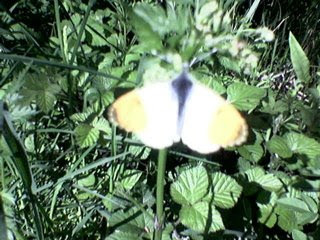 What is a butterfly doing here? Here is a competition, should anyone ever read this blog. 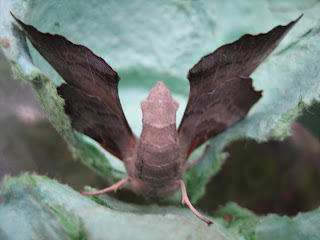 Draw an alien's face on the bottom of this Poplar Hawk Moth (for that is what this is). It's a fascinating moth, much the biggest of the ones I catch regularly in my trap. It rests with its fore and hind wings curiously back to front and curls its tail up like this. I have also caught an Elephant Hawk in the trap this week, a beautiful pink and lime green exception to the Black and Grey Rule (see below). Many thanks to my son Olly for helping me upload these pics. I'll try to add the Elephant Hawk all on my own tomorrow. Here is a Spectacle Moth, so-called for obvious reasons, though you have to look at it front-on to understand the name. 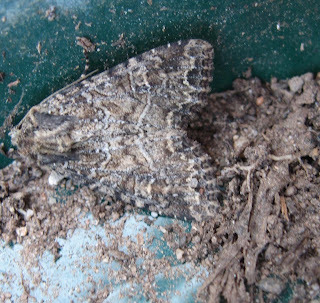 From above it is a mixture of blacks, greys and the like, which I am afraid is true of a lot of British moths. On close inspection, however, the patterns of these colours are often beautiful. It's just a pain trying to tell the species apart. Moths of the World, Rejoice! I don't yet know quite how this works, but I hope I will learn to keep an online record here of the many moths which I catch in my light trap in Leeds. I hasten say that they don't die. And here they will have a second life, eternal, so long as the Internet lasts.